"All of the flavors of a New York City lox and schmear bagel--cream cheese, capers, cucumber and lox--in a single, delicious bite." To make schmear, combine cream cheese, sun dried tomatoes, capers, red onion, garlic, and lemon juice in a bowl; stir well to combine. To prepare, spread 1-1/2 tsp. 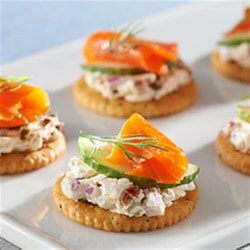 schmear on RITZ Everything Cracker and top with cucumber half and piece of smoked salmon.